Hi all – After a long Hiatus Crazy has returned. Just in time for Eldritch Moon spoiler season – And hoo boy is this looking like a good set. Here’s some of my favourite Green and Black cards that I’ll be keeping an eye out for at prerelease. For those unaware – I really quite like Eldrazi. I was in the minority of people that when Emrakul was spoiled whooped for joy. So it should come as no surprise when I say that one of my favourite green cards in this set is one that works with the Eldrazi’s new mechanic “Emerge”. A 1/1 for 3 is not great but it has two very relevant abilities. The first ability lets you replace this creature when he enters the battlefield with another creature from the top four cards of your deck – Which works great with the second ability, giving you extra value when you sacrifice this guy to pay for a creature’s Emerge cost. Dude’s an absolute value train in the deck that wants him and in the other green decks he’s still a solid 17th-18th pick or so. Now THIS is what I’m talking about! I’d play a Typhoid Rats in any shape or form but a 3/3 Deathtouch for G? Must be my birthday. 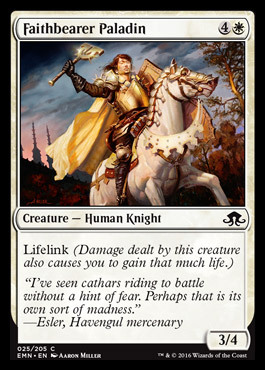 I will have a real hard time passing this card and I’m honestly expecting this to make waves in Standard – never mind how good it’s going to be in a nice aggressive GB limited deck. The only reason to not take this early is if you aren’t in the Delirium deck but I wouldn’t expect this to make it around a table. An incredibly aggressive pick with a equally incredible payoff for the deck that can support it. A 3/1 is ridiculously fragile, dying to anything any more solid than a stiff breeze. On the other hand with that evasion ability you can be damn sure it’s going to cost the opponent a card to bust this. When it flips though? Your opponent better have some premium removal handy. 3/5 is way more than enough to dodge most removal that doesn’t literally say “Destroy target creature” and for every turn they aren’t dealing with it your new best wolf buddy is giving you a horror token. The downside is that you’ll want to build around this one – he’s playable as is but with a decent buff or two he’s pretty unstoppable. Whispers of Emrakul, AKA DeliriHymn to Tourach might actually be my favourite card in the entire set – Because if there’s one thing I love when I’m playing Black it’s completely unfair discard effects. Not sure I’d play it if I wasn’t in the Delirium deck but this is probably one of the better reasons to if you ask me. Having said that it suffers from the problems other discard spells do in that they’re 100% dead in the topdeck wars. You’ll know why you played it when you pop it turn 3-4 and your opponent discards 2 land, skips their next land drop and doesn’t play anything. Music – or Whispers – to my ears. You may or may not have seen my good buddy’s article a couple days ago discussing the virtues of Faithbearer Paladin. Now I’ll parrot him a little here and agree with him that the card is pretty much the best common in the set. I will say however that I much prefer his vampiric cousin. For one – Haste in mono-black is pretty hard to come by, and when that haste is on a 4-power lifelinker that’s a pretty big tempo swing for your mana. At worst with another vamp that’s 4 life and a dead opponent creature, best case that’s an 8 life swing. On the other hand, unlike the Paladin this guy is going be so much more effective in his own archetype (Vampires). Without the haste he gets killed by a lot of removal the Paladin simply shrugs off having one less toughness – 4 seems to be a bit of a sweet spot in this set. 2/1 for 1B? Pretty playable. 3/3 Gravedigger? Also not terrible. But by their powers combined? Hooooly crap. As an aside – The scavengers bringing back the rats is a great interaction, and means that for a grand total of 7 mana you get your prize. That prize? 5 hasty menace. The bonus? +1 and menace to all of your OTHER creatures too. If you’re even slightly established on board this guy is an absolute blowout that’s pretty hard to stop from getting at least some value. The only real downside to it is that when they do kill it it’s a 2 for 1 by the very nature of the threat being a meld creature. Let me just bang on my big Delirium drum one more time. +1/+1 for each creature in your graveyard is pretty alright near the start if you’re in self-mill and playing things like the aforementioned “Grapple with the Past” you’ll probably drop it as a 3/3 for 3. In the same deck up around turn 7/8? This could easily be an 8/9 power creature for 3 mana. The card is crazy amounts of value but only in the self-mill deck – In every other deck there’s almost always going to be something just a little more efficient. That’s all from me guys – stay tuned this week for Dr. Janks’s review of his favourite Red, Colourless and Multicoloured cards of the set.